Society last November the above officers were elected. For a summary of our plans for 2003 look here. 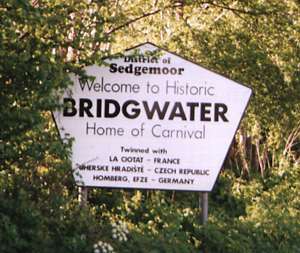 Wed 29th January;- Our Annual GENERAL KNOWLEDGE QUIZ to be held at the Bridgwater Labour Club. Starts 8pm. All welcome to bring teams of up to 4 people. 18/19 February;- We will be holding a Czech Business & Culture Seminar at Bridgwater House with a view to taking both a Trade Mission and a Cultural Fact Find tour later this year to the Czech republic. The Czech Embassy will be supporting the event. * Well, right now its very cold. Temperatures range from -18 in Uherske Hradiste to -6 in Prague and several inches of snow covers the land. mind you its -30 in Poland , -57 in Russia and a tropical -0 in Bridgwater. * Some of our Czech supporters have retained their seats in last Novembers elections and some have made sensational gains. In Prague the Mayor of Sedgemoors Partner district Prague 6 Pavel Bem (ODS) has now been elected Mayor of All Prague. 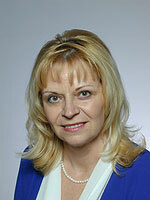 In Olomouc Cllr Jarka Cardova kept her seat and her party (KSCM) increased their representation. Unfortunately in the Smokovec region of Slovakia our friends Josef Kovalcik and Fero Koza (Soc Dem) failed to get in. 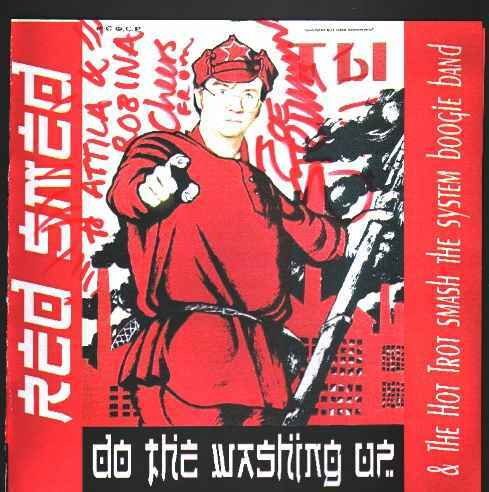 DO THE WASHING UP;- the new 14 track CD from Red Smed and the Hot Trot Smash the System Boogie Band -available for �5 (300sk or 250Kc). E.mail smedlo@globalnet.co.uk for a copy "DO THE WASHING UP" comprises 12 original songs about life in Bridgwater and the world plus 2 instrumentals of world revolution - 'The Internationale' and 'the Theme from the Magnificent seven' and features the musicianship of Kevin Freeman (drums) Matt Bartlett (bass) Captain Balderelli ( mandolin) and the vocals of Elaine di Campo, Heidi Powell and Cathy Smedley. However, not to put too fine a point on it, the star of the audio experience is Overview and Scrutiny ctte no 2 member cllr 'Fatty' Smedley (below) (the fat one) who plays guitar , harmonica and 6 string bass plus sings 'interestingly' throughout. Above is a copy of the cover signed by the late 'Joe Strummer' and dedicated to punk poet Attila the Stockbroker. 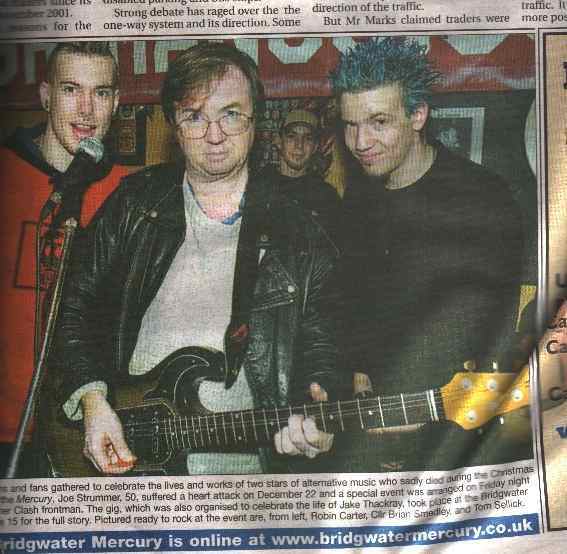 Members of the Bridgwater Czech Slovak Friendship Society recently held a memorial gig for Strummer at the Bridgwater Labour club (below). The gig was also dedicated to the memory of folksinger songwriter Jake Thackray. Both died over christmas. Bridgwater Czech/Slovak Friendship Society secretary Cllr Brian Smedley has written a small booklet to commemorate the 10th Anniversary of the Velvet revolution. 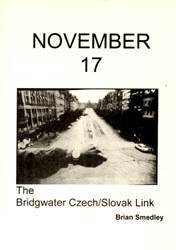 The booklet 'November 17' (left) tells of the Bridgwater 1938 by-election and subsequent events in the Czech lands & Slovakia until the velvet revolution of 1989. The last part of the booklet includes quotes and impressions of the last 10 years from Czech & Slovak members of the society. The book was launched on november 17 at a Commemoration event at Bridgwater town hall and included a telephone link up with Bridgwaters Moravian twin town Uherske Hradiste and coverage on the BBC.